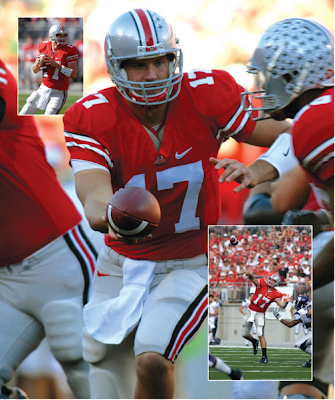 Today we continue the countdown of JJHuddle’s “Top 50 Ohio High School Athletes of the Decade” for 1999-2009. Every Monday through Friday from now until March 26, a new athlete will be released. 22. 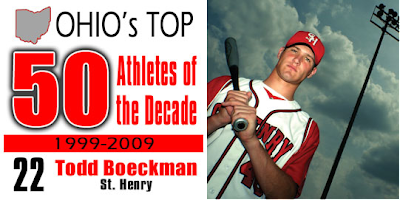 Todd Boeckman, St. Henry, Football, Basketball and Baseball, 1999-2003: Some might be surprised at Boeckman’s rank here, but his resume speaks for itself. Boeckman earned 11 varsity letters at St. Henry and led the Redskins to a state final in every sport (and two state titles). As a freshman QB he guided St. Henry to a runner-up finish in D-V. That same school year the Redskins – with Boeckman as sixth man – were runner-up in boys basketball in D-IV. That spring the Redskins won the D-IV state baseball title. St. Henry also won the D-IV state baseball title in Boeckman’s senior year. Individually, Boeckman’s name appears among the leaders in multiple state records and sports. In football Boeckman ranks No. 15 in career passing yards (7,021 yards, 1999-2002) and No. 18 in career passing TDs (64, 1999-2002). In baseball Boeckman is tied for No. 2 in Ohio history for most RBIs in a season (66 in 2003). Since his performance no one else has hit more than 56. He’s also tied for No. 3 for HRs in a season (18 in 2003), tied for No. 3 with HRs in five straight games (2003), tied for No. 4 in HRs for a career (40 from 2000-2003) and No. 12 for most RBIs in a career (140 (00-03). On the mound Boeckman is tied for No. 8 in most consecutive wins (19, 2001-03). The 2003 St. Henry team (Boeckman’s senior year) ranks No. 3 all-time in Ohio for hits in a season (389). In basketball Boeckman ended his career No. 9 on St. Henry’s career scoring list with over 1,000 points. He led the Redskins in scoring and rebounding his sophomore, junior and senior seasons. Boeckman earned All-Ohio honors (a total of seven times) in all three sports. AKRON, Ohio - Kent State Director of Athletics Laing Kennedy and former heavyweight wrestler Jermail Porter were among the 13 honorees at the Dapper Dan Club of Akron banquet on Sunday, Feb. 14 at The Tangier. Kennedy was given the William Falor Award For Career Achievement, while Porter, was one of 10 athletes presented with an achievement award. 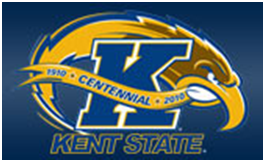 Under Kennedy's leadership, Kent State teams have won 87 Mid-American Conference regular season and tournament championships. Individually, Golden Flashes student-athletes have claimed 251 individual MAC titles while earning 84 All-America honors and 29 Academic All-America citations. In 2008-09 the Golden Flashes captured their fourth MAC men's (Reese) all-sports trophy. On the women's side KSU finished second in the Jacoby all-sports trophy standings - their 12th consecutive top three finish. An Akron native, Porter finished sixth at the 2009 NCAA Wrestling Championships, becoming Kent State's first All-American in 23 seasons. 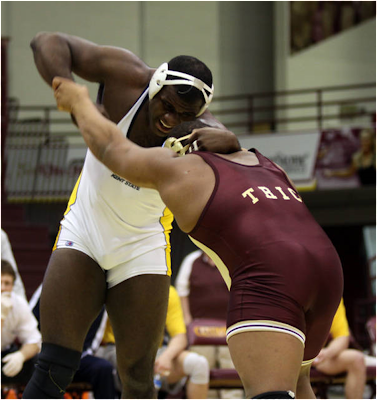 As a senior he was named Mid-American Conference Wrestler of the Year after winning tournament titles at the MAC Championships, the Southern Scuffle and the Body Bar Invitational. Porter's 119 career victories are the fourth most in school history. Also honored with an achievement award was former Kent State cross country runner Jeff Howard. A four-year letterwinner (1989-1992) at KSU, Howard has coached Woodridge High School to four consecutive state championships in boys cross country. He is in his 12th year of coaching track & field and cross country at Woodridge. Formed in 1959, The Dapper Dan Club of Akron holds annual banquets to recognize outstanding sports achievement, while raising money for local youth charities. This article immediately follows my free agent offensive tackles piece, which needless to say was a pretty pathetic list in terms of talent. Unlike offensive tackle, however, interior linemen are much easier to find because they don't require quite the same blend of size, strength, and athleticism. 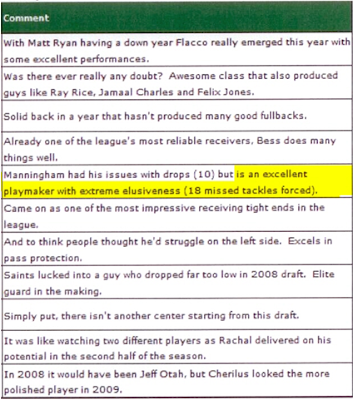 That being the case, the guard market will typically feature more overall talent than the tackle market, and things are no different in 2010. Neal has flown under the radar for much of his career in New England playing alongside some great talents and bigger names, but he's held his own as a former college wrestler and undrafted free agent. At 33, Neal won't be a long-term starter, but he still plays at a high level and can certainly be an upgrade for a lot of teams inside. A 10-year NFL veteran, Williams has started every game except three since the beginning of the 2004 season and is still highly productive. Part of a surprisingly effective Bengals offensive line in 2009, Williams has plenty of experience and great bulk for the position, making him one of the best short-term starters on the market at age 33. One of the original Texans, Pitts started the first 114 games of his career until a knee injury ended his season two games into 2009. Pitts hasn't always been consistent and has been part of some pretty bad offensive lines during Houston's early years, but he has lots of experience at guard and tackle and is still fairly young at 30. A knee injury disrupted most of his 2009 season, but Hadnot has been an above-average interior lineman for most of his career since being drafted in the sixth round by the Miami Dolphins in 2004. A versatile lineman who can start at both guard spots and center, Hadnot is still just 28 and could be a potential inexpensive find on the free agent market. Pashos has actually seen starting time at tackle in recent years, but he's over-matched at the position and really doesn't have any business starting outside. He does make for a strong backup lineman, however, with experience at guard and tackle and the ability to be a serviceable fill-in on the inside. Neal has been with the Patriots since 2001. Patriots offensive lineman Stephen Neal apparently isn’t ready to call it a career after all. “He’s going to be playing,” Cornrich told ESPN. The news comes as a bit of a surprise, especially in the wake of his comments after the playoff loss to the Ravens where the 33-year-old guard spoke openly about the possibility of retirement. 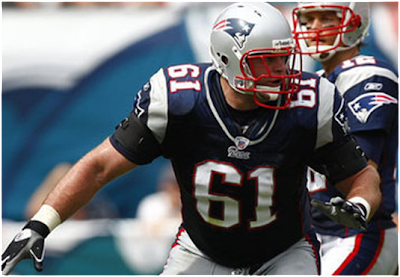 Considered one of the toughest players in the New England locker room — he has reportedly played through a myriad of injuries over the course of his career — the former collegiate wrestling champion joined the Patriots in 2001. After not playing football in college, he eventually won a spot with the Patriots. He worked his way up from the practice squad and earned three Super Bowl rings in the process. In his career, Neal has played in 78 games, starting 73, and earning the respect of Bill Belichick and his teammates. “It is a wonderful story about a guy that with hard work, dedication, overcoming the setbacks of the injuries and the lack of playing experience, has turned into, really, a good football player,” Belichick said of Neal’s football journey. 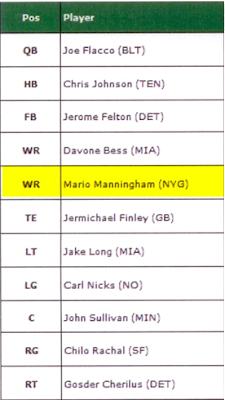 No offense to any of the Miami Dolphins’ other receivers, but 2009 provided plenty of evidence that Brian Hartline is the wide out with the most upside. This entry is not meant to speak badly about Ted Ginn Jr., or disrespect the hard work Davone Bess and Greg Camarillo have done to make themselves respectable NFL players. 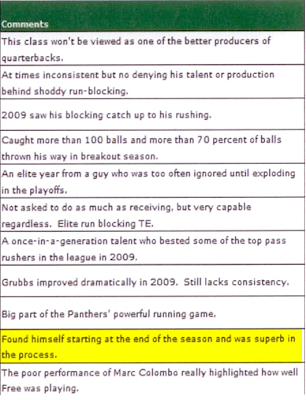 It’s also not meant to shame fellow rookie Patrick Turner for not developing as quickly as Hartline. This blog entry is meant to point out that this rookie out of Ohio State stood out from the pack, which is a good sign for a team in need of an upgrade at the position. Hartline, who contributed 506 receiving yards off 31 catches, produced most of the passing game’s biggest plays last season. He led the team in yards per reception (16.3), and also scored most of the passing game’s touchdowns in the red zone (four). Last season Hartline proved he can make tough catches (only two drops), possesses enough speed to open up the deep passing game, and his coaches swear he’s the smartest player in that unit. 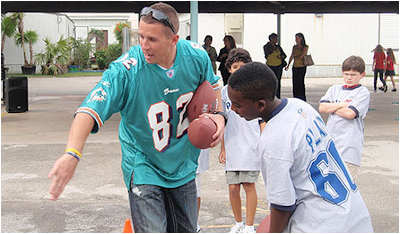 All those attributes likely means Hartline has the potential to do more. The potential to become a solid starter, helping the Dolphins’ anemic passing game grow while he continues to blossom. I predict he’ll be a starter in 2010, and I’m curious to see what’s the upside? During this unfiltered Hartline talks about the valuable experience he gained, and how it’ll benefit him next season. He said he felt he was “walking in the dark” his rookie season, but that’s no longer the case. But what kind of improvements can we expect? 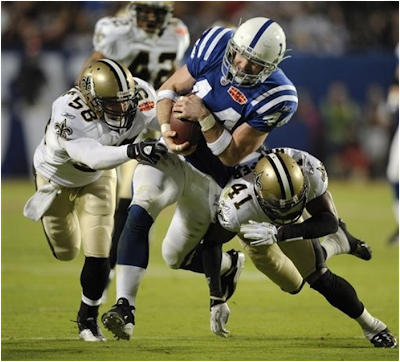 The Saints went 13-3 via a formula of high-octane, pass-heavy offense and creating turnovers in critical situations. They won Super Bowl XLIV in the same fashion. After a slow start, quarterback Drew Brees was near perfect. He completed 32-of-39 passes for 288 yards, two touchdowns, and no interceptions and was named M.V.P. of the game. Pierre Thomas and Jeremy Shockey scored New Orleans' offensive touchdowns. Cornerback Tracy Porter had the game-clinching pick six. There was some silver lining for Colts tight end Dallas Clark. He is now the postseason record holder for catches (64) and yards (847) by a tight end. The Colts did not score a single point after their first possession of the third quarter. Peyton Manning had 333 passing yards and completed 31-of-45 throws, but threw the interception and consistently struggled in the red zone. FORT LAUDERDALE, Fla. — Tom Santi grew up a Titans fan. He was in the stadium for the Music City Miracle, celebrating the big playoff victory with family and friends. Then the Colts drafted him, and everything changed. Santi, a tight end from Nashville’s Montgomery Bell Academy and the University of Virginia, is dealing with all kinds of emotions this week. He’s here with the Colts as they prepare for Super Bowl XLIV against the Saints, taking part in all the festivities and preparations. But he won’t play on Sunday. His second NFL season was cut short because of a back injury. Still, he has a chance to win a Super Bowl ring. Santi, regarded as a solid blocker, continued to make strides as a pass-catcher this season before he was placed on injured reserve. 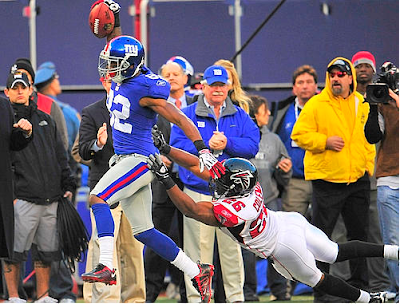 He had eight catches for 107 yards, including a six-catch, 80-yard game against the Ravens. Now he wants to prove that he can stay healthy. Santi had 10 catches in 2008 before a shoulder injury landed him on injured reserve. Colts quarterback Peyton Manning has seen enough of Santi to be impressed, however. “He’s had some injury issues, but I think he has a lot of potential,’’ Manning said. “He is a big, strong tight end who can run. He’s made a lot of plays for us. Santi’s parents Mike and Betty Ann will make the trip to Sun Life Stadium along with his sisters Lauren and Annie. The family still has a home in Green Hills, and Santi said he plans to spend plenty of time in Nashville this offseason. He just hopes to get back to the Super Bowl — and to be able to play in it. “I feel like I have definitely learned a lot from last two years,’’ he said. “I have been brought along watching Peyton and the older guys, watched Dallas and the way he works on his craft. It has definitely helped. By the end of his junior season at Miami, the only Hall of Fame that Cortez Kennedy seemed destined to make was for eating. At one point, Kennedy's weight had hit 370 pounds. "We called him, 'Three-play Tez,' " said UM coach Randy Shannon. "He was done after three plays." With Shannon's help, Kennedy dropped the weight and turned into one of the best football players UM has produced. One of 17 finalists for the Pro Football Hall of Fame, Kennedy will learn today if he will be inducted. Rickey Jackson, a Pahokee native and former New Orleans linebacker, and Boca Raton resident Cris Carter are among the group of finalists that also includes Jerry Rice and Emmitt Smith. "You look at the names, just to be on the ballot is amazing," said Kennedy, an eight-time Pro Bowler who played 11 seasons for the Seahawks and was named NFL Defensive Player of the Year in 1992. "I'm excited." Whether Kennedy will be selected for induction this year is up to the Hall of Fame's 44-person voting committee. That Kennedy is even under consideration surely didn't seem possible when he showed up at UM as a junior-college transfer in 1988. He played just two seasons for UM and was so out of shape his first year that he saw only limited action. "When he was fresh, nobody could block him," said Shannon. "But he couldn't keep it up. Cortez was a big guy who liked to eat." The summer before Kennedy's senior season, Shannon moved in with the defensive tackle. For a month, Shannon ate every meal with Kennedy, often selecting what they consumed. At night, Shannon would sleep by the refrigerator to keep Kennedy from snacking. "If he left the house, I would go with him," said Shannon, a UM linebacker from 1985-88. "I didn't let him out of my sight, unless he was with his girlfriend." Shannon also put Kennedy on a running program. Five days a week, Kennedy draped himself in a plastic garbage bag and ran up and down hills for an hour at a park. By the start of his senior season, Kennedy was down to 295 pounds. "I thought it was insane, but look where it got me," Kennedy said. "I tell everybody now, if it weren't for Randy Shannon I wouldn't be where I am today." 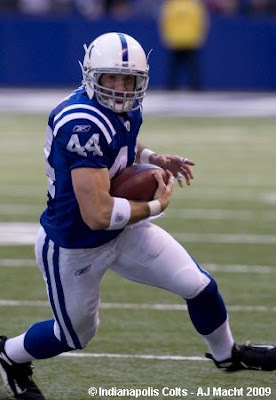 Dallas Clark's football career started as a linebacker in high school but he moved to tight end after walking on at the University of Iowa. These days, Clark is one of the leading receivers on the Indianapolis Colts' high-powered offense. 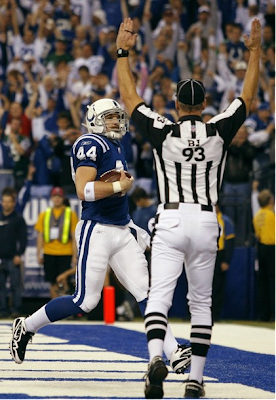 FORT LAUDERDALE — Dallas Clark earned first-team all-pro honors this season, heralding him as the best tight end in the NFL. He's surpassed many of the marks of Baltimore legend and Hall of Famer John Mackey in the Indianapolis Colts record book. And the New Orleans Saints defenders are quite aware they'll have to contend with him Sunday. Yet it's almost certain that Clark would not be enjoying his current success if he'd listened to his heart instead of his coaches. "I walked on at Iowa as a linebacker, and I just had it in my mind that I was going to try to be as good a linebacker as I could be," Clark says. "Then Coach (Kirk) Ferentz saw something in me and he wanted to try me at tight end. After about a year, I decided to try it." 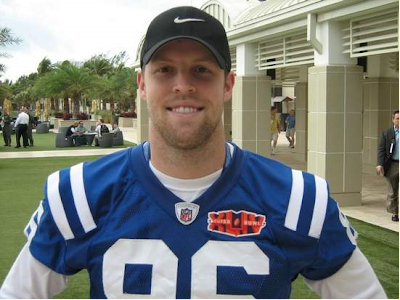 After finally relenting, Clark transitioned so effectively that he won the Mackey Award as the country's top tight end as a junior in 2002 and became a first-round pick of the Colts the next spring. So what was it that necessitated the fateful switch? "He was very athletic. ... He worked hard, seemed to be very eager to please you," Ferentz says. "(But) when we went on the field, the things we saw (off the field), quite frankly, didn't translate into production as a defensive player. "Sometimes, the abilities players have don't always translate when they are in the wrong position, and, clearly, we had him in the wrong spot." But now Clark makes a living putting NFL defenses in tough spots. 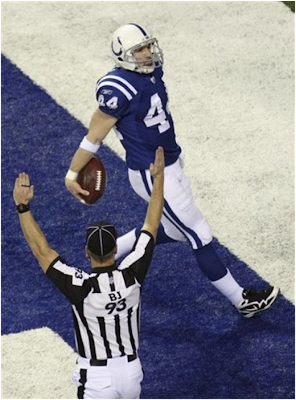 His value was on full display during the Colts' 2006 Super Bowl run, when he essentially replaced injured slot receiver Brandon Stokley. At 6-3, 252 pounds, Clark overpowered defensive backs, but he was much too quick and athletic for linebackers. "He just loves playing," Ferentz says. "(Colts president) Bill Polian put it best when he said Dallas enjoys getting his ankles taped. That's the kind of guy he is." Clark has played better than ever the past two seasons. He had a big season in 2008, catching 77 passes for 848 yards, eclipsing the best years of Mackey, who helped revolutionize the position in the 1960s. "Just hearing about what he's done," Clark says, "it's a true honor to be passing some of his records. "I really don't believe it myself sometimes. That guy has done so much for this position and the NFL, and he's given so much. He's what this game is about." But Clark raised the bar in 2009, earning all-pro and Pro Bowl recognition for the first time with 1,106 receiving yards on 100 catches, only the second tight end (Tony Gonzalez) to hit the century mark. "He's a sick tight end," says Colts center Jeff Saturday, adding Clark's awards were long overdue. "He's as good as there is in the business, and he has been the past few years. "He changes defenses by just being on the field." But Clark's best may be yet to come. "I'm still learning a lot," he says. "I don't think I've reached my top ability." 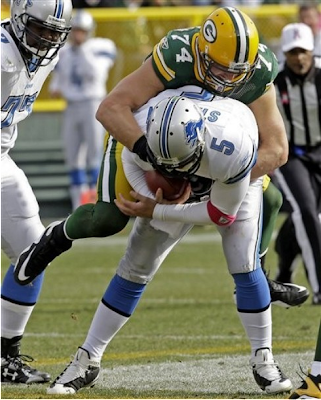 At 6 feet 3 inches and 316 pounds, Green Bay Packer Mark Tauscher, an Auburndale native, is an imposing presence. But this strapping, powerful football player has the heart of a teddy bear with an uncanny ability to connect with children. It was a dream come true for the third through fifth grade students at Our Lady of Peace Catholic School in Marshfield Friday morning when Tauscher walked through the gym doors of the school to talk with the children. 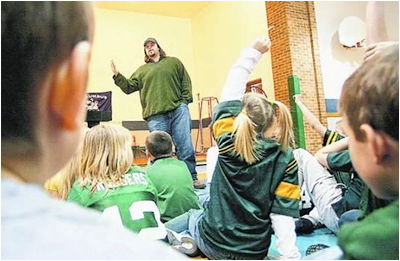 With teaching experience and a master's degree in education, Tauscher was as much at home chatting with the children about the importance of reading as he is blocking defensive linemen. "Twenty-one years ago, I was sitting right where you are now and I was having a hard time with reading," said Tauscher, who explained while he was in first grade, he was in a group of three children who had a difficult time learning to read. It was an unsettling experience because he wanted to be in the same reading group as his friends. So Tauscher went to his mother and she helped him devise a plan to improve his reading. "At your age if I hadn't come up like I did I honestly wouldn't be an NFL player. Without an education you can't get into the NFL. "I can't emphasize enough how important the schooling end is to athletics." His foundation with Associated Bank, Tauscher's Reading Initiative for Every Child to Achieve, has raised more than $110,000 to benefit literacy and education in Wisconsin. The awed students slowly warmed to asking Tauscher questions. Within minutes, hands were waving for his attention and Tauscher patiently answered questions for 30 minutes, which varied from his favorite color to Super Bowl predictions. "What was your favorite book?" asked Wyatt Bauer, 11, of Marshfield. "Charlotte's Web. Did you read it?" Tauscher said. Heads bobbed and more hands shot into the air. "What's your happiest memory?" asked Taylor Tolppi, 9, of Hewitt. "I just got married so that's the best answer," he said. The first question for Dallas Clark at Super Bowl media day came from a 4-foot Weekly Reader reporter: What do you like most about being a tight end? In Clark's case, there's a lot to like. He's part of a new breed at the position, stretching defenses by catching passes downfield like a wide receiver for Peyton Manning and the Indianapolis Colts. Clark became NFL's highest-paid tight end when he signed a six-year contract in 2008, and he made the Pro Bowl for the first time this season, when he had a career-high 100 catches. He'll try for his second Super Bowl ring Sunday against the New Orleans Saints. "The thing about being a tight end, you can line up in a lot of different positions and do a lot of different things," Clark said. "I can be in the backfield. I can be out wide and try to act like a receiver sometimes, and be in with the big guys and try to block big defensive ends. I just love the versatility of the position." Fifteen years ago, there might not have been a place in the NFL for the 250-pound Clark, who's at a size disadvantage when he blocks ends or linebackers. But Tony Gonzalez of Kansas City and Antonio Gates of San Diego made the tight end a more popular target for quarterbacks, and Clark has accelerated the trend. "They aren't just blocking tight ends or single-route runners _ guys who just go to the chains, turn around and catch the pass," Saints safety Darren Sharper said. "These are guys who can spread out and match up against cornerbacks and create mismatches against linebackers and make plays all over the field. "When Dallas Clark came into the league, you knew he was going to be that type of tight end, because he's so athletic. And he's playing with Peyton Manning, who knows how to get him the ball, so it's tough to stop." Manning and Clark have become the highest-scoring QB-TE tandem in the NFL, with 41 touchdowns since Clark entered the league in 2003 as a first-round pick from Iowa. That's only four TDs behind the NFL record for a quarterback-tight end combo set by Drew Bledsoe and Ben Coates with New England in the 1990s. Clark's productivity as a receiver has steadily climbed the past four years from 30 catches to 58 to 77 to 100 this season. He joined Gonzalez as the only tight ends to reach triple figures. Clark had 1,106 receiving yards in 2009, a tight-end record for a franchise that produced a Pro Football Hall of Famer in John Mackey. But Mackey played mostly in the 1960s, a different era for NFL offenses. "Gates and Gonzalez really opened up the gates," Clark said. "The position has gone in a direction where, with a guy like me who probably can't block every play, it gives the offense a different option and defenses a different thing to try to defend." While the Colts' high-powered offense is sophisticated, offensive coordinator Tom Moore makes Clark's role sound simple. "Dallas is a great athlete," Moore said, "so get him the football." The Colts did that well the last time they played at Miami in September. Clark made an 80-yard touchdown catch on the first play and finished with 183 receiving yards, the fourth-highest total for a tight end since the 1970 NFL merger. In November, he tied the team record for receptions with 14 against Houston. It's not that Clark can't block. He wins praise for improving that part of his game, and said he tries to use good technique to make up for his size disadvantage. "He has made a number of big plays for us in the passing game, and oftentimes people would think that's the only thing he does," coach Jim Caldwell said. "But the fact is he's a very capable blocker." That was his primary role in the AFC championship game. After the blitz-happy New York Jets sacked Manning twice early, Clark began helping with pass protection. "I ended up blocking a lot of the game," Clark said. "Things change as the game continues and we figure out how teams try to defend us." Clark hopes there's no repeat _ he'd rather catch passes. And the Saints are bracing to deal with him. "Do you put a linebacker on him? A defensive back? A safety?" coach Sean Payton said. "You've got to decide how you handle him. He brings so much to the table." Thank goodness. The most overrated day in sports. The day that 18-year-old football players all over the nation sign letters of intent -- and otherwise normal, responsible adults become blithering idiots as they celebrate (or berate) their schools` recruiting classes. No doubt, recruiting has become a business unto itself. In this economy, I`m all for any kind of business that provides a few jobs, and there are certainly jobs to be had in the recruiting industry. When I first had the misfortune of being forced to pay attention to college recruiting (I still haven`t forgiven former sports editor Dan Creedon), there were a couple of "experts" out there who printed a couple of magazines a year rating high school recruits. Today, that has expanded exponentially. There are Web sites with analysts, gurus and insiders. ESPN has joined the fray. Pony up a few bucks a month, and you too can receive continuous updates from your favorite expert concerning the whims and musings of 18-year-olds everywhere. Find out who has verbally committed, who has de-committed and whether you should be committed for worrying about it. There is even a vocabulary particular to recruiting (seriously, if I hear an 18-year-old kid has given a "soft verbal," I`m making sure he`s not getting anywhere close to my niece. But that`s just me). And, there are the rankings. Grown men and women who are usually level-headed in most circumstances lose all touch with reality when it comes to recruiting rankings. If your favorite team has atop-10 class, it`s reason to celebrate. Drop into the 30s (or 40s or 50s), and it`s reason to seek tall buildings with ledges. There are those who swear by the rankings, those who swear at the rankings and those who believe the rankings can be used as one small piece of the puzzle when evaluating the overall health of a program. Put me in the last group. Revelation time: Great programs recruit great players. The cycle is self-perpetuating. But the rankings are by no means a guarantee of anything. Case in point: Michigan`s last four recruiting classes have been ranked Nos. 2, 9, 10 and 6. Yet four years of the best players in the nation last year produced a 5-7 record for the maize and blue. Then there`s Cincinnati, which last year finished 12-1 and ranked eighth in the nation. Somehow, the Bearcats managed this despite not having a single class in the last four years ranked better than 51st (with two of those classes ranked Nos. 70 and 80). Yes, I know. Texas has a top-ranked class -- and Texas will be good next year and the year after and the year after that. Ditto for Southern Cal, Alabama and Florida. But I don`t need to look at recruiting rankings to know that Texas will be a top-10 program just about every year in the forseeable future. I don`t need a guru to tell me that Alabama is likely to be pretty doggone good for the next half-dozen years. But I`ve also seen plenty of kids with no hype attached to their name turn into very good players. It`s simple. As my good friend Joe tells me -- at least once a week -- "Coaching makes the difference." 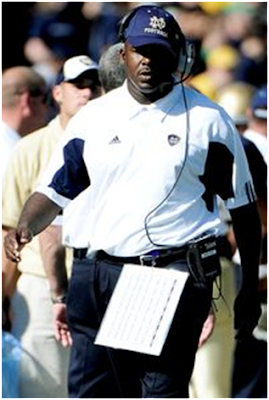 Pair great recruiting classes with a bad coach and you won`t have a good team. Pair average recruiting classes with a great coach and you`ll have a good team. Pair great classes with a great coach -- and you have Alabama. Which is why I`ll be neither excited nor disappointed today when Dan Hawkins announces his latest Colorado recruiting class. 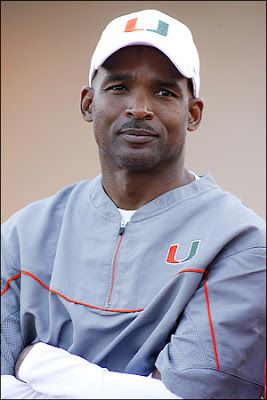 Rather, I`ll wait until spring ball and fall camp to see what Hawkins is doing with the players he`s recruited. Stars and rankings? I honestly don`t know how much stock to put in them. 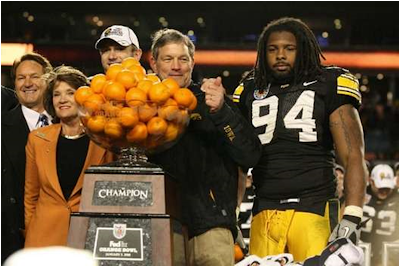 Kirk Ferentz`s last three recruiting classes at Iowa were ranked Nos. 37, 40, 44, yet the Hawkeyes finished No. 7 in the nation last year. Who could have predicted that? But this much I do know for dead certain: "Coaching makes all the difference." It`s time for Hawkins to make that difference. From Tim Griffin's Mailbag: "Pelini is my post-bowl Big 12 Coach of Year"
Steve Russell of Loveland, Colo., writes: Tim, quick question for you. If you were picking a conference coach of the year including the bowl games, who would you select? Tim Griffin: After the regular season and conference championship game, I picked Mack Brown because of his 13-0 record. 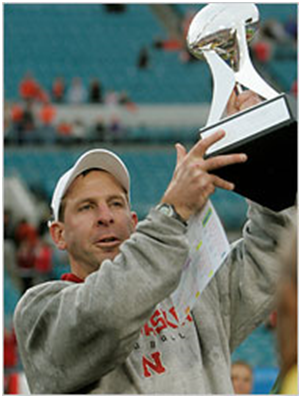 But including the bowl results, I would lean to Bo Pelini, with Brown closely followed by Paul Rhoads of Iowa State. I think Pelini was able to get a lot out of a team that struggled offensively for much of the season. The Cornhuskers had one of the most imposing defenses in recent Big 12 history with Ndamukong Suh, Jared Crick, Prince Amukamara, Larry Asante, Phillip Dillard and Co. They had a 10-4 record, but the Cornhuskers were very close to a couple of more wins. With a fortunate break or two, the Cornhuskers could have ended up winning the Iowa State and Virginia Tech games during the regular season and the Big 12 championship game. They came legitimately close to a 13-1 record this season. Pelini deserves much of the credit for getting them into the championship game and for their victory over Arizona in the Holiday Bowl.